For me there is nothing better than breathing out, dumping all the air from my BCD and descending into the ocean. From that moment I leave all the stresses of my world behind and become one with the movement of the water. After slowly floating down to be consumed by the colours of the sea I find the perfect buoyancy and become weightless, finding myself in complete comfort. I slow my breathing down and connect with every breath as I inhale and exhale, rising and falling. This is my bliss. Learning to dive in Wellington three years ago was one of the best things to ever happen to me. 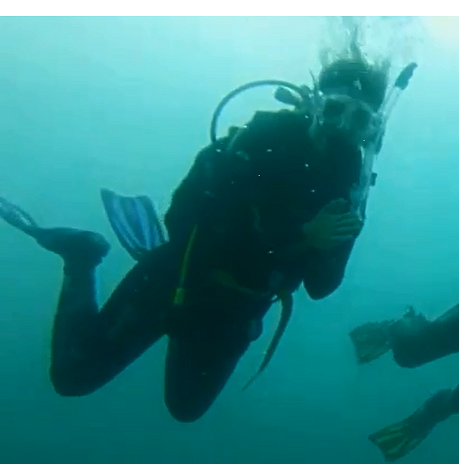 If you are ever to learn, Wellington is the best place to do it, simply because it creates good divers because you have to have yourself together to dive here – 7mm wetsuits, lots of lead, a heavy tank, all the dive tools, tide running and changing wind. It is physical. Yet you can be under for over an hour and sometimes not even notice. Wellington has amazing dive sites – filled with plenty of big friendly fish, crayfish to catch, kina, and varying terrain. Not one dive is the same, and not one dive is boring! Two years ago I set off with my partner diving our way around the Pacific and South East Asia. We ended up managing a popular dive centre in Sydney. However, all the “fish bowl diving” of the tropics made both of us miss the wonderful Wellington waters. So we have come home and are setting up a unique dive training centre – “Dive Makara” – which is scheduled to open this September. I think that if everyone found the magic of blowing bubbles underwater, the world would be a more peaceful and happier place!